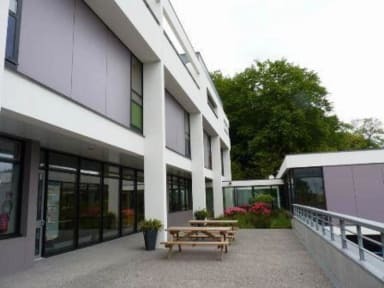 Close to the heart of the city and facing the harbor, the Youth Hostel of Morlaix open all year long, individually or in groups, passing through or staying. 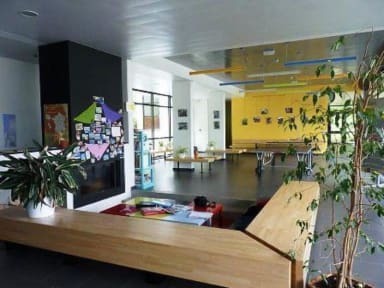 Built in 2008, the hostel is quite modern, consisting of recent equipped rooms. Yann, our director, and his team are at your disposal to inform you about our services (accommodation, catering, conference), our prices, and to advise you on things to do nearby and current events. We will welcome you anytime of the year in our very modern hostel! Clean, friendly, comfortable beds, interesting guests doing interesting things! Thanks for your hospitality! I thoroughly enjoyed my all too brief stay at the Auberge De Jeunesse (Youth Hostel) in Morlaix. The Staff, particularly the Receptionist, were very helpful. In addition, the breakfast was really, really nice; with a choice of cereal, fresh bread, lovely jam, coffee and juice. Overall, the auberge de jeunesse was really excellent value. For example, my bed in a 4 bedded female dormitory, including breakfast, was just €20 per night. C'etait superbe, Margaret O'Keeffe-Gould, 5 Juillet 2018. Great location and easy to find close to Marina, helpful staff, clean and tidy Hostel well maintained facilities and pleasant environment. Would definitely use again if in the area and therefore I am happy to highly recommend. Very kind and friendly staff who arranged for me to store my luggage after my night's stay so I could see the town. Given my own room with en-suite shower. Quiet location, good facilities. Only criticism - pillow was stained. There was another clean one in my room though which I used. Great clean modern building friendly staff. The people at the desk didn't have my reservation which already booked and didn't really speak much english which made it a bit difficult. There was really no atmosphere here what so ever, and one of the things they failed to mention on here is that there is about 14 handicapped people being looked after in the hostel which is something that really needs to be mentioned. I didn't really feel comfortable there at all. The room and hostel is fine it just suffers from lack of other travellers.